MedTech is a family-owned company that cares about each person and situation that we help with. We are an emergency response company with service locations to cover all of Washington, all of Idaho, the Portland Oregon area, and parts of western Montana. We are ready to personally take your call when you are in need. 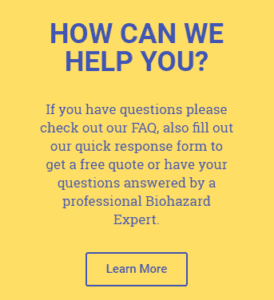 Our professionally trained biohazard technicians provide specialized cleaning, sanitizing and odor removal. A hazmat-certiﬁed working supervisor is on each job to insure the job is done right. We stand behind our services, and customer satisfaction is guaranteed. MedTech has been serving the Pacific Northwest including Washington, northern Oregon, Idaho, and parts of Montana for over 25 years. We work to help families, property owners, and law enforcement when they need peace of mind.